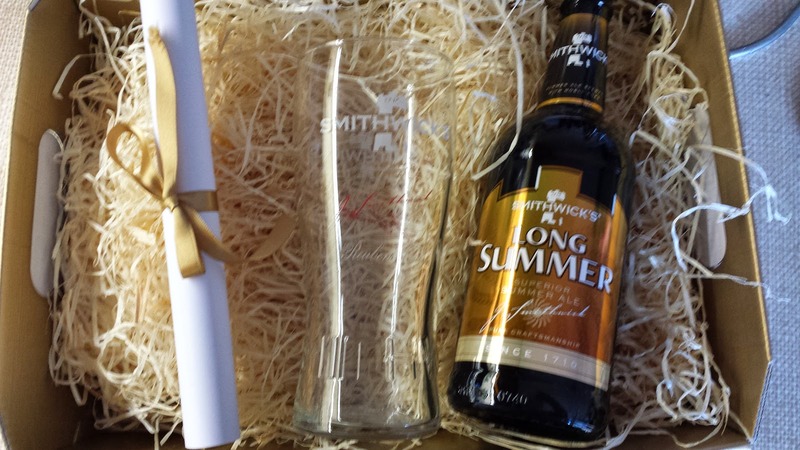 I received a gift basket from the Smithwicks marketing company recently. It contained a sample bottle of Long Summer to review, a Smithwicks glass and some spiel. It's not often I get samples from the big Irish breweries, mainly because they tend not to do anything new. The exception seems to be Smithwicks these days. They released their pale ale and winter spirit in recent years. While winter spirit is just a darker version of regular Smithwicks, the pale ale is at least a very sessionable and tasty pale ale. It might not be a patch on the likes of Metalman but I wouldn't be disappointed to be in a pub that served it. 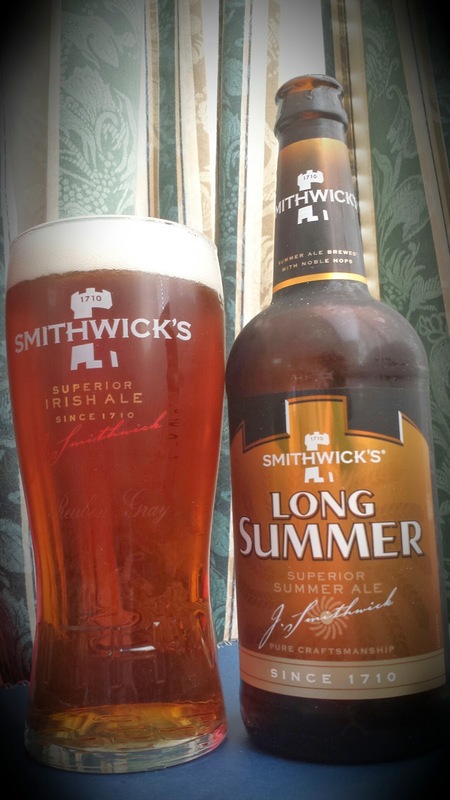 Long Summer is the latest release from Ireland's oldest existing beer brand. Unfortunately, the brewery itself is now closed and all brewing operations have moved to Dublin. How's the beer though? Well, it's sort of like a cold sprite. It's incredibly refreshing and thirst quenching. I was put in mind of an amber lager, it had that clean citric bite you get from a good lager. As far as I know, this is a top fermented ale but I reckon there's a little cold conditioning going on. I have to say, I rather enjoyed the beer. Would I seek it out? Not personally no. I am a bit of a beer snob after all. It's a good sessionable summer beer that keeps you refreshed and will not offend anyone. There's enough flavour to keep you interested but not so much to offend your average pale lager drinker. I can see where they are going with Long Summer and they have hit the nail on the head. Their pale ale is a little too much for some people but this will go down very well with anyone who drinks it. The only problem I foresee is a generic problem with a single brand/style rather than a brewery with many brands/styles. To most people in Ireland, Smithwicks is Smithwicks. It's a red ale that a lager drinker has little interest in. The same way Guinness is a stout, so if Guinness releases a non stout, it wouldn't quite work out. I wonder how people will actually view Long Summer then? Will the Smithwicks badge put off lager drinkers? Is it only existing Smithwicks drinkers who might give it a go? I'm often curious about these things. Enough digressing though, my conclusion is that it's a decent beer that I would be happy to drink. I would personally be happier drinking something else but I reckon the average beer drinker will appreciate it. Here's to seeing more diversity from the big Irish breweries. I don't think I've ever met anyone for whom SPA was too much, but maybe those are just the hoppy circles I move in. There is an awful lot of Winter Spirit still on the shelves, if that says anything about how the Smithwick's brand extension project is going. You don't move in those circles but SPA would offend a certain element of pale yellow fizzy stuff drinkers. There was still a lovely display of Winter Spirit in Vicar Street on Saturday night and I would have been glad to try the Summer version just for something different. Don't people enjoy Harp? Isn't that a point against your argument? Harp doesn't really exist here. You need to go north to drink it, and sure they're all nuts up there. Seriously, as TBN said, it's a very rare thing to see Harp in Ireland unless you go to NI. It has a terrible reputation whether deserved or not. Diageo don't care because they also brew Bud in Dublin and that sells much better. The Tale Of The Ale: Hoping For A Long Summer?